In approximately 1741, Richard Green purchased over 400 acres of land near the Delaware River. He then divided off approximately 250 acres of this land and established Blooming Grove Farm. West Upper Ferry Road, as it is known today, was for many years called Blooming Grove Road. Upon Richard’s death in 1797, the farm was inherited by his eldest son William R. Green, who had been an American soldier during the Revolutionary War. He in turn passed the property on to his two sons around 1812, and the last member of the Green Family to own Blooming Grove Farm became Richard’s grandson, James B Green Jr., when title passed to him in 1847. The building that stands today was built in the mid 1860’s after the original house on the property was dismantled. It is difficult to find information concerning the years after James Green’s death, but it is likely that the current building became the Blooming Grove Inn. Located a half mile from the Delaware River, it was an ideal place for a stage coach stop. Original hitching posts can still be seen on the property. At the turn of the twentieth century the property was known to be a restaurant, and was a well-frequented speak-easy during Prohibition. Mary Marks purchased the property around 1950 and christened it Mary Marks' Ewing Manor. A 60 year old menu that was recently discovered boasts "Food of Distinction," and indeed it was. Many people of influence frequented Mary Marks' Ewing Manor, including baseball great Ted Williams, according to local legend. After a quarter of a century of success by Mary Marks, the torch was passed to the Lieggi Family and carried for 26 years more as Lieggi's Ewing Manor. Mr. Lieggi, a true blood Italian, served as the Executive Chef and really showed Ewing Township what real Italian home cooking was all about. Customers still savor his Chicken Spezzatini, one of many specialties. Along with his wife and children, and later grandchildren, he gave the town all he had until he hung up his Chef's cap in 2002. For approximately 12 years after that, the restaurant was known as Paulie's Anna Rose. 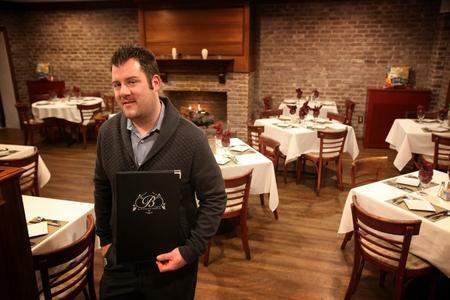 Steve Jordan purchased the restaurant in February of 2014 and gave it the transitional name of Paulie’s Restaurant and Saloon. During this time a massive restoration process took place, led by Steve Sr and Master Carpenter Mike Bause, and on November 21, 2014, the restaurant was re-christened Blooming Grove Inn. In the spring of 2015 we started a large vegetable garden in the backyard that yielded, among many other things, the hottest peppers in the world. We planted and harvested the world record holder Carolina Reaper, and we expanded the garden in the spring and summer of 2016. Soon, things will be "Blooming" everywhere, and the concept of Blooming Grove Farm will continue to be brought back to life. For now, sit back for a great meal, to hear about what's still to come, and to enjoy the ever evolving building that has been a treasured part of Ewing's history for over 150 years. We thank you for joining us tonight. Because of customers like you, Blooming Grove Inn is now in it’s 5th Year!